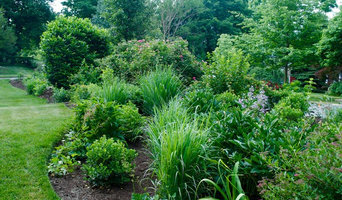 Elisa Meara’s Native Plant Landscape Design Corp is a small company based in Northern Virginia that specializes in garden designs using plants that are indigenous to our area. The goal of the firm is to help homeowners who yearn for a beautiful garden that brings them closer to nature, in a kind and sustainable way. Elisa develops designs that match the specific needs of the client and the location, using plants that are native to the American Northeast. The company was established in March of 2013. It was born in the hope of providing the community with a new and different landscape design option. Beautiful gardens, that can be designed, developed and maintained in the most environmentally sound ways, using plants that support the local eco-system. The purpose of the company is to create unique and personalized garden designs that can be developed into artful, beautiful gardens. These designs reflect influences from the modern and naturalistic garden designs of Europe. Our designs use mostly native plants of the American Northeast. We are strong believers in environmentally sound gardening practices. We also believe that people benefit from being surrounded by nature and beautiful spaces. There are numerous benefits in using native plants in residential gardens. These plants are beautiful and very low maintenance, there is no need for extra watering after they are established. They thrive without the use of any fertilizers or harmful chemicals. But most important, they are the foundation of our local eco-system. Native plants are the primary source of food and refuge for our local birds, butterflies, and other wildlife. The state of Virginia has hundreds of beautiful indigenous plant’s species. Our mission is to help our clients create dream gardens that are also functional. Gardens that give you something to look forward to in every season. Gardens that will lend a hand to the wildlife and that are kind to the environment. For more than a decade, we have been serving the Maryland, Northern Virginia and Washington, D.C. areas. Owner Adriano Maschioro founded the company on a basis of quality and excellence. An all inclusive landscape design and installation company for all aspects of outdoor living. Patios, decks, screened porches, retaining walls and grading, pergolas, arbors and fencing. Joseph Richardson Design is a boutique landscape architecture firm practicing throughout Washington DC, Northern Virginia, and Maryland. Our team of landscape architects and landscape designers specialize in the design and implementation of residential and commercial gardens that link people, architecture, and nature. In our firm the designer and the principal are the same. The company and the individual you deal with directly are the same. The advantage is consistent translation of your ideas from the first discussion to the finished drawing. JOSHUA SCHAAF, principal, has more than fifteen years of professional practice, specializing in the design and master planning of custom residential landscapes, swimming pools, and outdoor entertainment areas in the Northern Virginia, Maryland, and the greater Washington DC area. At Exquisite Exteriors, we infuse purpose with creativity to design residential gardens that seamlessly blend the natural and built environment to create vibrant, functional outdoor rooms. 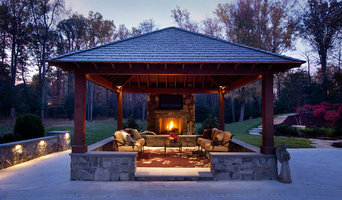 Geoscape, Inc. is a full service, award-winning landscape and hardscape design / build company serving Northern Virginia. For over 26 years, we have provided our clients with unique and creative landscapes, hardscapes and outdoor living space solutions. Arlington/Alexandria Landscape Architect 30+ Years of Experience! We are an award winning company that designs, builds, installs & maintains outdoor spaces that let homeowners & their families enjoy them to the fullest. Arbors, decks, fireplaces & much more! Meadows Farms is a full service landscape installation firm. I bring 18 years of experience helping clients achieve their goal of creating beauty and solving problems. Landscape Design is my great Passion. I love working closely with my clients to transform their landscapes into comfortable personal sanctuaries that will continue to inspire and enrich their lives. We are a full service landscape and hardscape firm servicing Northern Virginia. Our mission is to build lasting relationships by providing quality work and exceeding expectations. Fine Landscapes specialize in custom pools & spas, outdoor kitchens, water features, stonework & paving surfaces, cabanas, horticulture, fireplaces, pergolas, and more. Tiger Lily Landscapes, LLC is a Northwest, DC based, distinctive landscape design/build firm that provides you with custom service tailored to your specific needs and expectations. Groff Landscape Design is a full service landscaping and hardscaping design and build firm. We believe that we provide a customer experience unlike any other in our industry. We genuinely care for our clientele and their outdoor projects. We customize both short term and long term plans around our clients needs, wants and goals. The feedback that we most frequently receive from our clients is that our communication and high level of detail far exceed any contractor that they have ever worked with. We do this with great systems, phenomenal people and hard work. * Groff is currently booking in July for all installation work. * Groff projects are from $20,000 up. Meridian Landscaping provides full-service landscape services for commercial and residential clients throughout the Washington DC area. We provide a variety of services to achieve your vision of the ideal outdoor or indoor living space. We can implement a pre-existing design or offer advice to improve your home design. For over 25 years, we have provided our clients with unique and creative landscapes, hardscapes and outdoor living space solutions. We are a unique company built on a solid background of design and construction. With a young and driven team, Outdoor Spaces offers innovative and creative design solutions for all of your outdoor living needs. For 30 years, our company’s mission has always been to create and enhance exceptional residential gardens, providing their owners with outstanding service and expertise. Contemporary and Timeless Landscape Design. Katia Goffin Gardens aims to design brilliant harmonious outdoor spaces. We are a small boutique design and management practice with a thorough acquaintance of all design fields and their methods. Coming from European backgrounds we bring cross cultural perspective and innovative design experience to the gardens they create. Katia and her collaborators have been designing beautiful gardens for over 25 years. Based on classical methods of landscaping, their designs make use of nature, natural spaces, materials; man made elements and structures to bring a contemporary thoughtful twist to the gardens they craft. No matter the scale of a project we seek clients who share their vision of garden aesthetics and dedication to creating unique outdoor spaces. 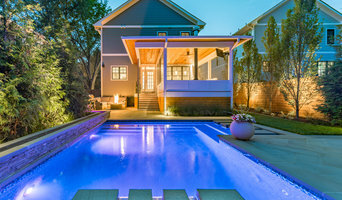 Best of Houzz Winner! Residential landscape design specializing in creating custom, unique residential gardens of all scales from Loft Roof Terraces to Estate Master Planning. We are a high-end design/build firm comprised of Landscape Architects, skilled craftsmen, & experienced landscape crewmen all joined together as one team to serve the needs of homeowners. Sunrise Landscape + Design is committed to providing the best personal landscape experience to residential and commercial clients throughout Northern Virginia. Professional landscaping anchors a house to the site, connects it with the environment and creates a welcoming entrance to a home. A Falls Church landscape architect or designer works with living plants as well as building materials to design for future growth and maintenance as well as the present visual appeal. Landscape architecture is very regional, so look for a landscape designer in Falls Church, VA that’s familiar with the local climate and plant types that do well there. Start here to learn more about the landscaping services in Falls Church, VA that will help create your dream garden. The work of this outdoor professional includes most everything surrounding a home's exterior. A landscaping architect can even work with the home architect to choose the right spot for your Falls Church, VA house. From there the Falls Church landscaper will develop preliminary concepts for your front or backyard design based on individual needs including the climate and activities that will take place, as well as layouts and planting plans. Landscape architects will also design any structures or outbuildings that will be added to the space. Any grading changes that will be added to the yard are also the responsibility of the architect. This includes any drainage modifications. An engineer can also be responsible for these tasks, but licensed Virginia landscapers are fully capable. Like building architects, they will produce preliminary concept drawings as well as detailed construction documents and planting plans. Three-dimensional renderings and illustrative plans are all supplementary. A Falls Church landscaping designer generally will have ecological, aesthetic and technical training, which helps them maximize the potential of your outdoor space. Keeping in mind both style and functionality, garden designers analyze your architecture and yard to produce a plan that may or may not include location and materials for walkways, patios, water features, fences, garden aspects and more. In addition, a landscaper in Falls Church, VA will carefully assess your geographic region to choose plants, trees and flowers that will flourish naturally, as well as address concerns such as drainage, screening and soil conditions. Certain landscape designers only help with the planning portion, while some may deliver the plans and then oversee a hired landscaping contractor. Others — typically following a design-build approach — take care of both the design and all aspects of the landscape architecture and construction. Before you hire a Virginia professional landscaper, consider the scope and emphasis of your outdoor project. Landscape architects, who typically hold advanced degrees in their field, are trained to develop comprehensive structural plans that include plants, hardscaping, water use, drainage and more. Landscape designers typically specialize in the aesthetic and horticultural, rather than structural, side of yard and garden planning. They might or might not have advanced training. Even within their fields, a garden designer may specialize in hardscape- or vegetation-focused designs. In some cases you might need to hire additional help to get the outdoor space you want. Here are some related professionals and vendors to complement the work of landscape architects & landscape designers: Landscape Contractors, Garden & Landscape Supplies, Tree Services, Gardeners, Lawn Care & Sprinklers, Decks, Patios & Outdoor Enclosures. Find a Falls Church landscape architect on Houzz. 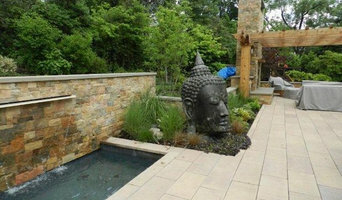 Narrow your search in the Professionals section of the website to Falls Church, VA landscape architects and designers. You can also look through Falls Church, VA photos to find a space you like, then contact the professional who posted the photo.